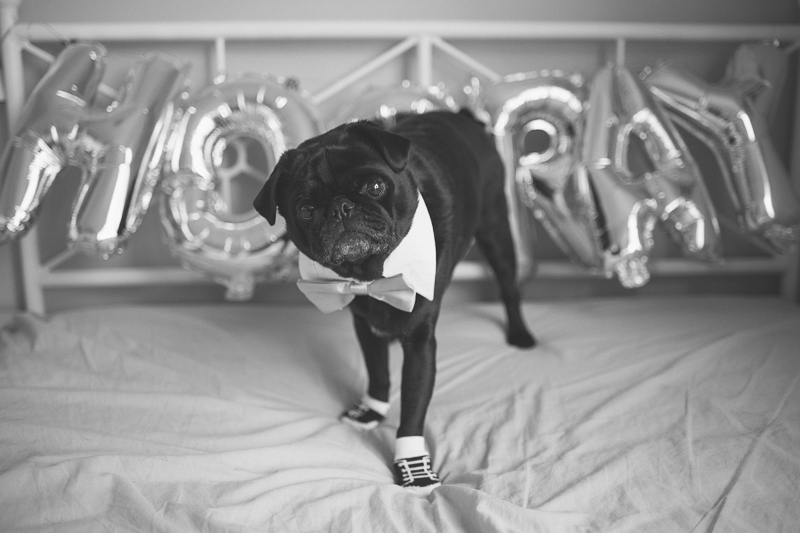 Does your pug seem to hate having photos taken? Or perhaps they are so energetic they turn into a blur? I am going to share with you some tips on how to get your pug to look at the camera. 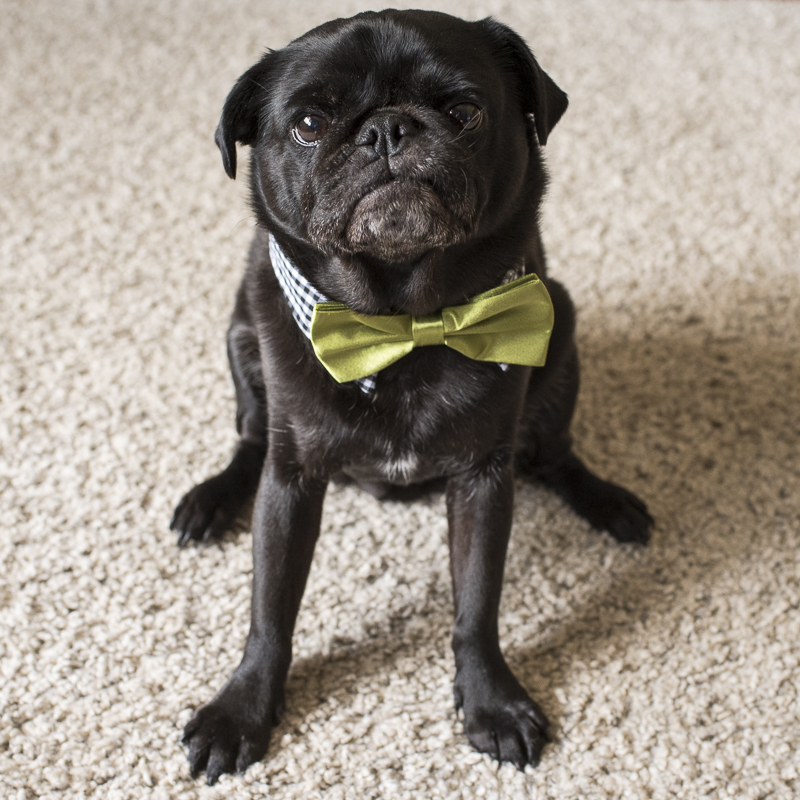 Hopefully these tips will turn your camera shy pug into a poser. 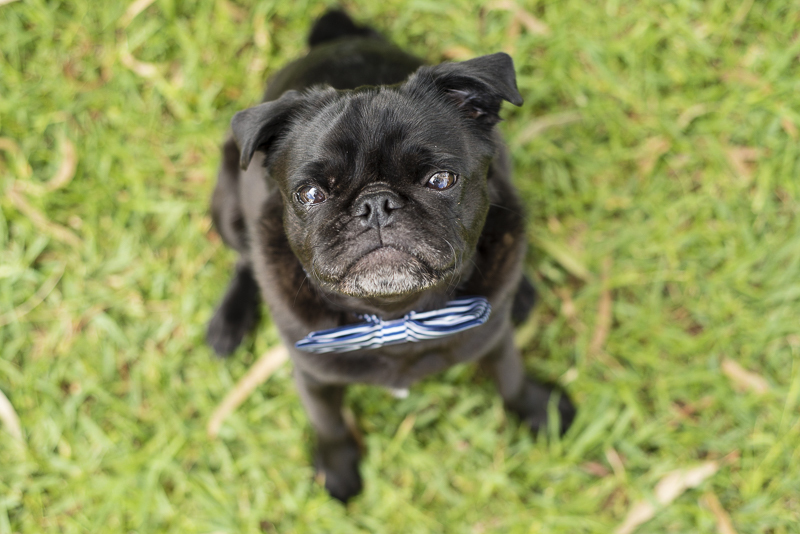 When taking photos of any dog whether you are a pro photographer, an amateur photographer, hobbyist or just a pug parent with a camera phone, the key to getting any quality photo of your pug is patience. Keep calm the entire time even if they are not cooperating as your frustration will be felt and make your pug more likely to play up. 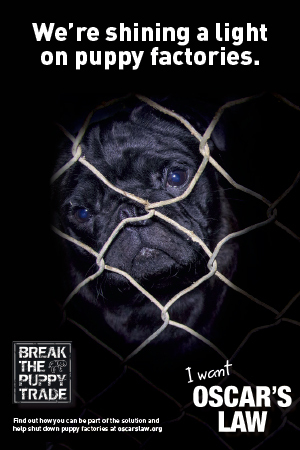 If it gets too much for either you or your pug, take a break. It could be just thing you both need. Relax and having a play will calm things back down and then you both may end up be ready to capture the perfect photo. 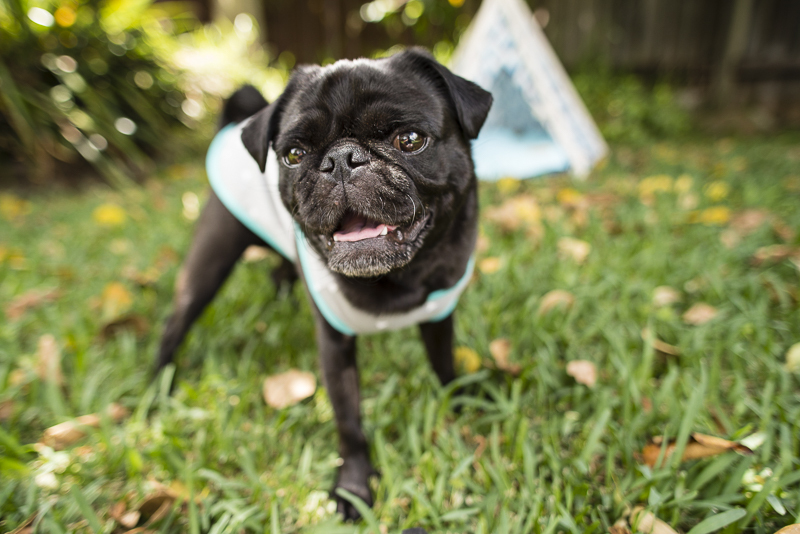 When you have such an energetic pug, it can be extremely hard to get them to calm down and sit still for a few minutes to capture that snap. The best way to get them camera focused and calm before a shoot is to have them well exercised so they use up most of that energy. We don’t want them falling asleep as soon as the camera comes out so take note of how much exercise wears them out and cut it back 10 minutes. This can be a play at the dog park, a walk or just some playtime at home. Either way, use up that energy so they are less likely to run away from the camera. Hands up who loves to be praised or rewarded for doing a job well done? Well it’s no different for dogs. And taking photos of your pug is just another training task that needs to be taught, practiced and rewarded. So every time your pug looks at the camera, reward them with a treat, a pat and a big well done, even if the photo doesn’t work out. The more you reward the things you want them to do, the more likely they are to continue to do it. A great technique to get your pug looking at the camera is to first work on getting them to look at you without the camera. Use the command “look at me” and direct their gaze to your eyes with a treat and then reward them immediately. Once you have consistently got them looking at you just using the command without direction of the treat, you can introduce the camera and go through the process again of getting them to look at you but with the camera in front of you. If you need to, use the treat to draw their attention and then reward immediately after doing this. The more you practice this, the easier it will become to take photos. 10-15 minutes of this everyday will have them turning into a pro model in no time. 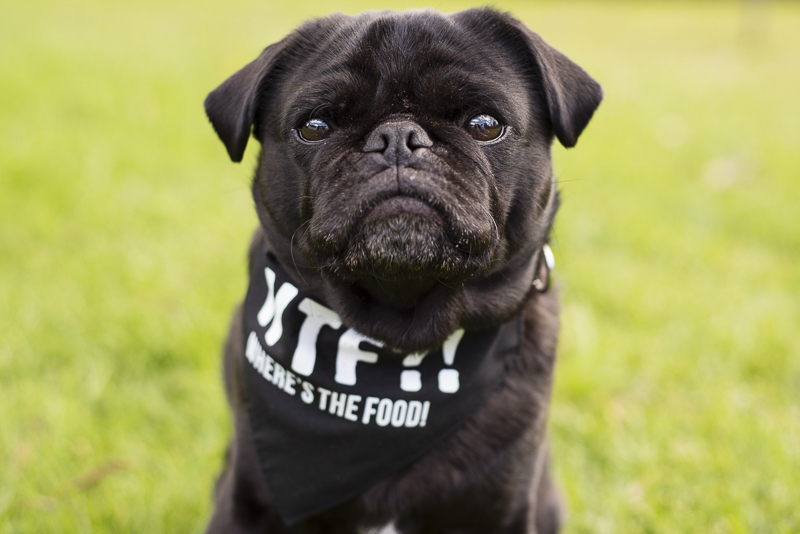 If your pug by some chance is just not food orientated or gets overly excited about food that they can’t stay still, try using a squeaky toy or unusual noise to grab their attention. A squeaky toy usually gets a dog to prick their ears up and look in the direction of the sound. You can hold the toy above the camera or even just behind your back. If a squeaky toy isn’t enough, try making different sounds to get their attention. High pitched sounds like making a kissing sound work well as do animal noises. If you are using a camera other than the one on your phone and you aren’t very good at making funny or animal noises, there are various apps that will be able to do this for you. I would avoid using animal noises if typically your pug reacts negatively to them. Any dog will become bored and even agitated doing the same thing for too long. When taking photos, it is definitely best to keep it short and sweet. Limit your photo shoot to no more than 20 minutes before taking a well deserved break for both of you. You will be surprised at just how many photos you can take in 20 minutes and you’ll be bound to get one good shot in there. Always end the session with rewards whether it be a play with their favourite toy, a treat, walk or some one-on-on time for cuddles. When you are both refreshed and ready to focus on taking awesome photos again, you can try another round. 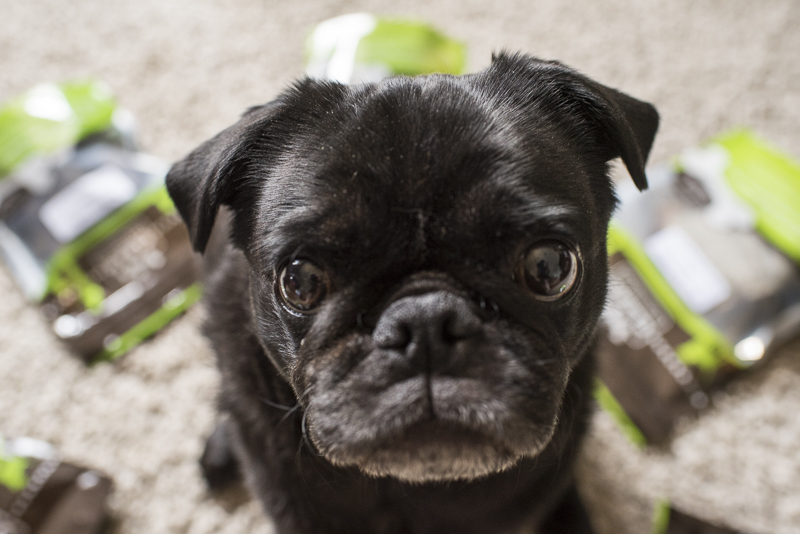 When it comes to taking photos of your pug, it really is just another training exercise. The more you do it, the better it gets. When I first really got into taking photos of Ref, I was going through a lot of treats and getting only a handful of good images in a longer period. The more we did it, the less treats I needed and the quicker the sessions became. We are now at the point that 98% of the time, one treat is given at the end of the session only. We are getting our ideas pumped out in 10-15 minutes. And best of all, Ref associates having photos as something fun. I now just pick up my camera, show it to him and say, “let’s take some photos” and he is up and trotting into our photo taking spot and ready to pose in just a couple of minutes. This hasn’t happened over night either. I have been taking this style of photos with Ref for probably about 12 months now. And it has only been in the last month or so that I’ve been able to take things to the next level with him and we are tackling photos I never thought we would be able to do. So with some time, patience and a lot of love and treats, the sky is the limit. 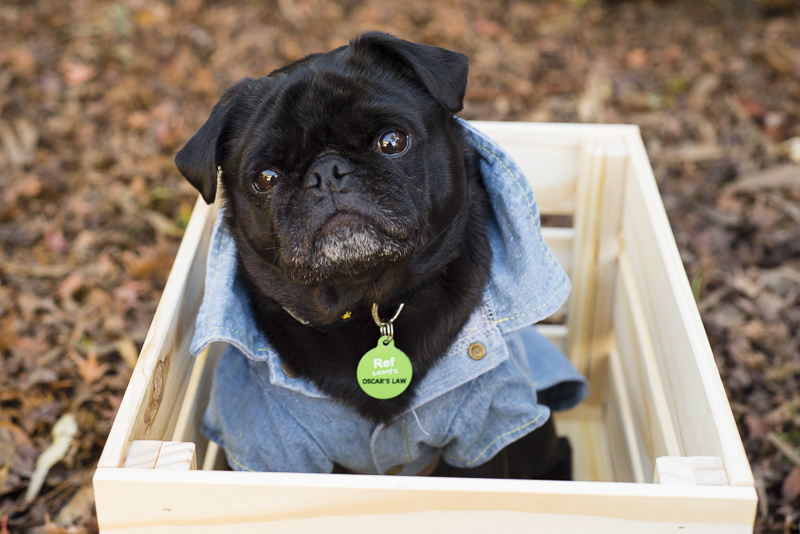 Don’t give up on getting that perfect photo of your pug. It will come. Thanks for stopping by Tammy. Oh you should definitely try taking photos of your chihuahua. I think any dog that can be trained, which is any dog really, can be trained to look at the camera. It has only been the last 6 months roughly that I’ve been able to start taking the photos of Ref that I have been and he is 4 years old. Good luck and let us know how you go. Aw thank you Lily. I’m very lucky to have Ref in my life. Definitely give these tips ago with your dogs. I truly believe that every dog can be trained to have their photos taken cause you can train dogs to do so much. Training is really great for them mentally so adding in something fun for al of you is a bonus. Have fun with it! And thanks for stopping by. I love all of the advice, almost as much as I love your GORGEOUS photos of Ref. He’s incredibly photogenic I think (not to take anything away from your super powers behind the camera). His little grey beard is so adorable 🙂 I’m going to try your tips with my hyper Border Collie, wish me luck, haha. Thank you Jo! Ref is unbelievably photogenic making it so much easier for me to take photos of him. I’m so darn lucky to have him in my life. I love his little grey chin too. His paws are full of grey hairs too. I am sure you can get some great photos of your Border Collie. Please do share with us on Facebook, Instagram or Twitter the photos you do get. We love all dogs, not just pugs. Great post Kristy – I know this is something that many dog lovers have troubles with! Gorgeous photos of Ref you’ve included too. You (and your readers!) might be interested in the post I wrote on this subject last year for Pretty Fluffy – http://prettyfluffy.com/style-photography/pet-photography/pet-photography-tips-5-ways-to-get-your-dog-to-look-at-the-camera! Thanks Kerry! And for sharing your article too. You are much more experienced with pet photography than I am so your article is a great addition for my readers to have a look at. I actually hadn’t seen that article previously. It is a great one. It must be something about Pugs. Chow is so energetic but then when a camera comes out he just knows what to do. He has big eyes and likes to pose with his face. I am however going to try these tricks with Killa because she loves me so much that when I call her name she just wants to get close to me. That’s funny you say how Chowski knows to look at the camera. I had to train Ref to and even more training to introduce the props. 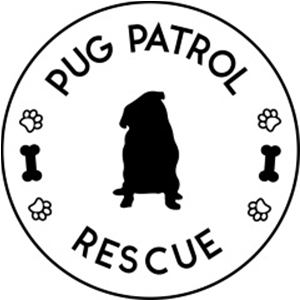 The reason I wrote the article was that I have read a lot of comments between both The Pug Diary and Ref’s Instagram account along with people we meet at pug meets that how hard they find it to get photos of their pugs looking at the camera. I hope some of these tips help with Killa. Adorable! How long does it take you to get each of these gorgeous shots for just the one post!? I had some experience recently of trying to photograph a very energetic staffy who was far more interested in everything around us (it was an outdoor shoot) rather than looking at me and my camera. I did a few clicking noises which kind of got his attention but now know I’ll need to find a squeaky toy or iphone app as I plan on photographing more pets at work! Thanks for these tips! Thanks Cheryl! Very rarely does one of our little photoshoots go beyond 20 minutes anymore. Usually less though but that has taken months of training to get to that. If I have one shot in mind and only need the one, it is done in just a few minutes. I posted one photo on Ref’s Instagram account (@refthepug) where I spelt out cheese with cheese then had him lying in behind the word. That particular photo took longer to spell out the word than it was to get Ref to lie behind it and get the photo. The photos you took were very good. I would definitely suggest the owner take the dog for a walk to use up a lot of their energy before the shoot which will help make the shoot a bit calmer. Let them have a sniff around so they feel comfortable in the environment and then do some training with them if they don’t do well with basic commands already. Sit and stay would be the main ones so just do a few of those commands and reward them with a treat each time before getting into the shoot. They will be more likely to cooperate when they know they get rewarded for their efforts. And also just get the owner to bring along their favourite toy or have one on hand to get their attention. I’m sure with each shoot you do, it will get easier for you.